Posted On July 08, 2015 by Team iCynosure. Today was a day when I felt #UmmeedHai as I witnessed the press launch of Like OK’s new series 'Ek Nayi Ummeed - Roshni'. Produced by Pulse Media that specialises in realistic cinema, the series follows the life of Dr Roshni; played by Pooja Gor of 'Mann Ki Awaaz Pratigya' fame. The protagonist values life over rules and thus refuses to be bound by protocol to do her best to save lives. As the promos have started to air since the last few days, there are two things that will definitely strike a chord with the viewers. One is the thrilling, realistic and gut-wrenching storyline and the other is the stellar star cast. The series will bring out the human element of the profession with the trials and tribunals that doctors face not only from people but also from within the community. With such a hard-hitting story-line, the producers did a great job on bringing on board veteran actor Amol Palekar at the helm of things. Just his presence on the show reiterates the fact that the show is no run-of-the-mill farce but a heartfelt story of compassion and humanity that prevails in the healthcare practice. While interacting with the cast this afternoon, it was evident that each of them felt strongly about the screenplay and were deeply rooted in the character. 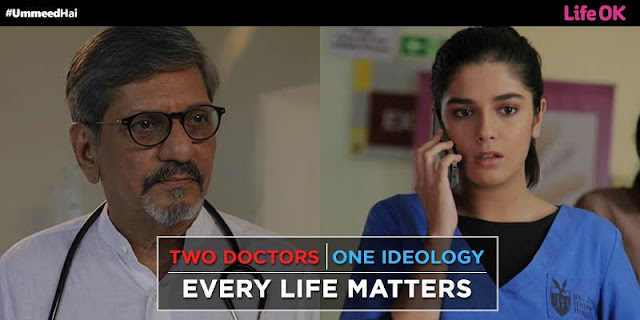 Each character has been portrayed with numerous layers of personality that bring out many positive sides to the medical field based on morals and hope along with unbiased trust. Pooja, who has played the lead role of Pratigya in the Star Plus show, essays yet another women-centric character that of Dr. Roshni. Speaking to her it was clear that she felt a strong connection with the character and lived through the emotional and professional dilemmas that a practice demands. Torn between what is morally correct and what is legally correct she chooses the former without fear of the latter. She is definitely the one to look out for, given her spectacular performance in her earlier outings. The one person I was so keen to meet was Divya Seth Shah. I have been following her work since the Hum Log days and am not afraid to say I was smitten. While discussing her role she expressed so much with her eyes that it was impossible not to feel her infectious excitement. Playing Dr. Roshni’s mother, she will bring about the balance between the moral aspect of the profession and the commercialisation for sustainment. Dishing out real-life experiences in various public service arenas she had us agreeing to the difficulties of the noble professionals including that of teachers, doctors and cops. A bridge between the two generations in the series is how she summed up her character’s journey. With a bank of strong characters over the years, Divya is definitely going to be the show stealer here. Sharing screen space with them will be Raghuvir Yadav, Rahul Vohra and Sahil Anand. The show will be on air from July 13th, 2015; Monday to Friday at 8.00 pm. Will Ek Nayi Ummeed… Roshni bring a paradigm shift in television content?